A pretty funny movie with a great premise about a guy who lends out his apartment to the higher ups on a regular basis. The Apartment is a great little romantic comedy. It’s one of those films with a very simple, yet creative plot that gets conflicted as it goes on and pieces start to come together. There’s a terrific setup here about a guy named Baxter who is being taken advantage of by his bosses at work. They use his apartment on a nightly basis as if it was a hotel room, and bring women over to have secret affairs. Baxter is starting to get sick of this. then there’s a wonderful money wrench that’s thrown into the story involving the big boss and the woman Baxter has feelings for. The movie does slow down in its second half, but it’s still a lot of fun. The Apartment is a romantic comedy that is both creative and fun. That’s in large part because the romantic angle is the least part on anyone’s agenda and doesn’t really creep in until the end of the film. It’s also because the storyline is fresh and fun, about a guy who is a total sap and the way the world takes advantage of him. This guy is C.C. Baxter, played by the great Jack Lemmon. He’s got an unusual situation with the men he works under at the office. Baxter has a number of bosses, and he lends his apartment out to them on a nightly basis. That means he allows them to pencil in dates that they will need his apartment to bring women over, and use his home as if it were a cheap motel room or a brothel. These men are all cheating on their wives, and so they can’t bring the women over to their place. And the idea of using a hotel never really comes up. Maybe when this movie was made, people just didn’t do that. Hotels didn’t charge hourly rates and nobody wanted to pay for an entire night. Whatever the reason, Baxter is basically running a service and not getting paid a cent for it. Instead, he keeps getting reassurances from these higher ups that they will put in a good word for him with the big boss and that it will lead to a promotion. This is the situation we walk into at the start of the film. Baxter spends the nights waiting outside his apartment for the people who are using it to come out. He has neighbors who think he is a party animal with a different girl every night and can hear him through the walls. We just assume these neighbors never see any other men going in there with women, because it works better for the comedy angle, for them to think it is all Baxter, himself. The first twenty minutes of this movie are superb. Everything is explained by having us watch the revolving door situation of his apartment, and seeing Baxter at work, really hoping for that promotion. When he gets a cold, one day, and decides he needs to take a night for sleeping and getting better, it causes a tremendous ripple effect. He wants his apartment to himself for the night, and has to call three different men to change their plans so that this can happen. The guy who had the room penciled in for that evening changes to another night, but the night he changes to, is already reserved by someone else, and the whole thing is like a giant game of phone-tag, going back and forth. It’s pretty amusing. Aside from the situation he has gotten himself into, between lending out his apartment, and getting his foot in the door with the higher ups so that it leads to a promotion, Baxter also has something else going on in his life. He has a crush on the elevator operator. 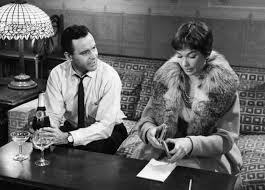 she’s Fran Kubelik, played by Shirley McClaine, and he never does anything other than make short conversation with her. baxter doesn’t even know anything about her, such as whether or not she has a boyfriend or where she lives. the day comes when baxter is finally called upstairs to the floor where the big boys work. he is so excited when he gets into that elevator with fran, telling her he’s about to be a changed man. we start to expect that maybe he will be wrong, and they won’t give him that promotion after all, but the movie has other plans. now, for the first time, baxter meets the real boss, mr. sheldrake (played by fred macmurray.) sheldrake wants to know what kind of business baxter is running that these men would speak so highly of him, without actually working with him. sheldrake thinks maybe it’s some kind of a gambling racket. baxter tells sheldrake the truth about the apartment, and something very strange happens. sheldrake asks for the key. he wants to take advantage of this apartment situation too. he’s exactly like the others, only this is the guy who really makes the decisions, and he gives baxter that promotion he’s been after. sheldrake also gives baxter two tickets to a musical that evening, telling him to go out and enjoy it while sheldrake uses his apartment. now things start to get interesting. baxter asks fran out to go see music man with him. fran tells him that she has plans to go out with another man, but that she will leave that date early to come meet him at the theatre for the show. all of a sudden we start following fran. this is the first time we have left baxter and are taking a new character’s perspective. we soon see why. as she walks into the bar where she is meeting this date, we see who the man is… it’s sheldrake. all of a sudden we are caught in the middle of a love triangle. baxter has finally gotten what he’s always wanted from the job, but when he finds out that sheldrake is using fran, the woman of his dreams, things get a little hairy for him. everything is put into conflict. espcially after one night where fran takes sleeping pills in an attempt to kill herself, because of the ways that sheldrake has been treating her. 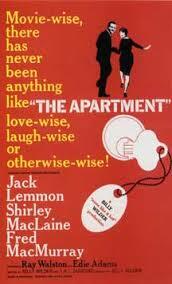 the apartment is a very enjoyable film. it’s a movie with a clever storyline that combines both work and play. the main character is a guy with multiple bosses who learns to overcome his desire for a promotion in choose romance instead. that might be the cliched message of the film, but it’s the situation surrounding baxter’s apartment and how he lends it out that makes this movie feel so original. there is a ton of conflict in this movie and that’s what really keeps it going at all times. the film does slow down in the second half, once fran starts staying with baxter, and everything seems too clear and obvious, but up until then, it really had things going in the right direction.